A daintier version of my leaf earrings are now available in my Megan Leone Etsy shop. The ultra suede, leather and chain is re-purposed from jewelry and accessories that I have deconstructed to re-use their materials. Each piece is one of a kind and handmade by me. They are super light weight, no drag! 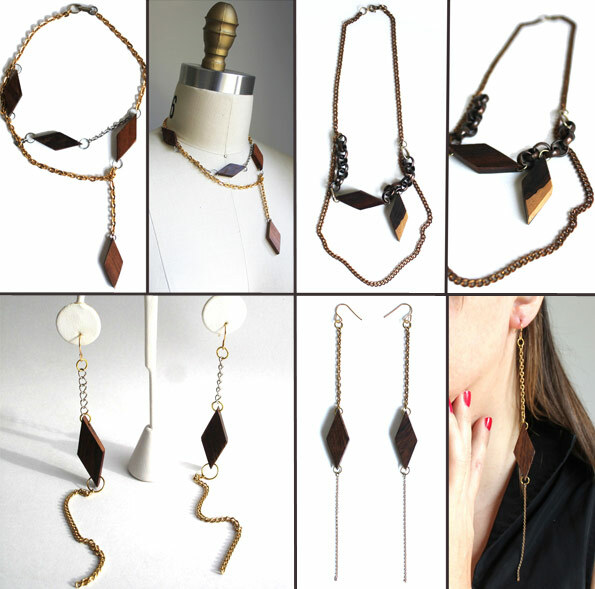 My wood diamond and chain jewelry is back by popular demand! Earrings and necklaces now available in my Megan Leone Etsy shop. The wood beads and chain are re-purposed from jewelry and accessories that I have deconstructed to re-use their materials. Each piece is one of a kind and handmade by me.